GATINEAU, Que.—Prime Minister Justin Trudeau reaffirmed his commitment to enhanced, robust Indigenous rights May 2 as he pleaded for more patience from senior Aboriginal leaders—but his rhetoric rang hollow to a number of chiefs still staunchly opposed to the Kinder Morgan pipeline. 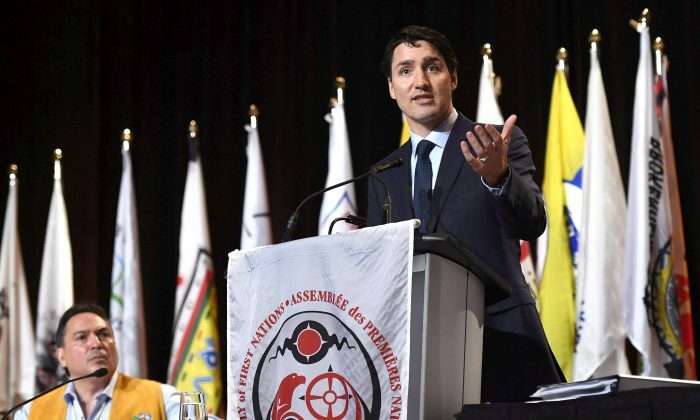 Trudeau kicked off Day 2 of the Assembly of First Nations annual meeting with a speech aimed at easing some of Indigenous community’s growing frustration with his Liberal government, a sentiment that was clear from the question-and-answer session that followed. Rushing headlong to action for action’s sake is not the answer, Trudeau said when he was pressed to commit to taking tangible, measurable steps towards meeting his promises to First Peoples in Canada. “I get the underlying impatience about these issues and I agree with you on the impatience,” he said. Indeed, no other group of people in Canada is as entitled to be cynical about government promises, the prime minister acknowledged. But the Liberals have embarked on a monumental effort to repair the relationship and build a true nation-to-nation process, which isn’t going to happen overnight. “We can do this quickly, or we can do this right—and I know that those two are mutually exclusive,” he said. For two days, the frustration has been palpable at the ongoing meetings in Gatineau, Que., across the river from Parliament Hill. Many chiefs and elders expressed concerns about how changes to a number of laws currently making their way through Parliament will impact Indigenous people and communities—and whether their concerns are being fully heard by Ottawa. Also front and centre during the meetings has been the government’s rights recognition and implementation framework; some chiefs say First Nations should be working on the affirmation rather than mere recognition of rights they say are already enshrined in the UN Declaration on the Rights of Indigenous Peoples. Trudeau repeated his commitment to a framework that would ensure the recognition of rights as the basis for all relations between Indigenous peoples and the federal government going forward. “It means new policies developed together will replace rights-denying measures … so communities can exercise their inherent rights to self-determination and self-government,” Trudeau said. At a news conference later, First Nations chiefs from Quebec, Manitoba, and British Columbia vowed to resort to large-scale civil disobedience if Kinder Morgan’s controversial Trans Mountain pipeline from Alberta to the B.C. coast goes ahead without the consent of local First Nations. The Liberal government’s efforts to push the project forward have shown “blatant disregard” for the rights of Indigenous nations they say have not been properly consulted, the chiefs said. “[Trudeau] came here and made a statement reaffirming, ‘The most important relationship is with our Indigenous people,’” said B.C. Neskonlith Band Chief Judy Wilson. The issue is “bigger than Kinder Morgan,” added Quebec regional chief Ghislain Picard. Squamish Nation official Khelsilem, who goes by just the one name, delivered a less nuanced warning.